It has been beautiful and sunny lately here in LA, well minus those rainy days. And all this sunshine and warmth really had me wanting lemonade. In the summers I love making blueberry basil lemonade. Tart and sweet with a wonderfully herbacious nuance from the basil. Since it isn’t quite summer yet, I decided to hold off on the lemonade and instead make muffins. Can we talk about lemon muffins, specifically meyer lemon muffins or cakes or quick breads, I mean there is just something so wonderful about meyer lemon muffins. Are you with me? I love making these meyer lemon muffins and these too! But this new one with blueberries and basil really kicked it up a notch. 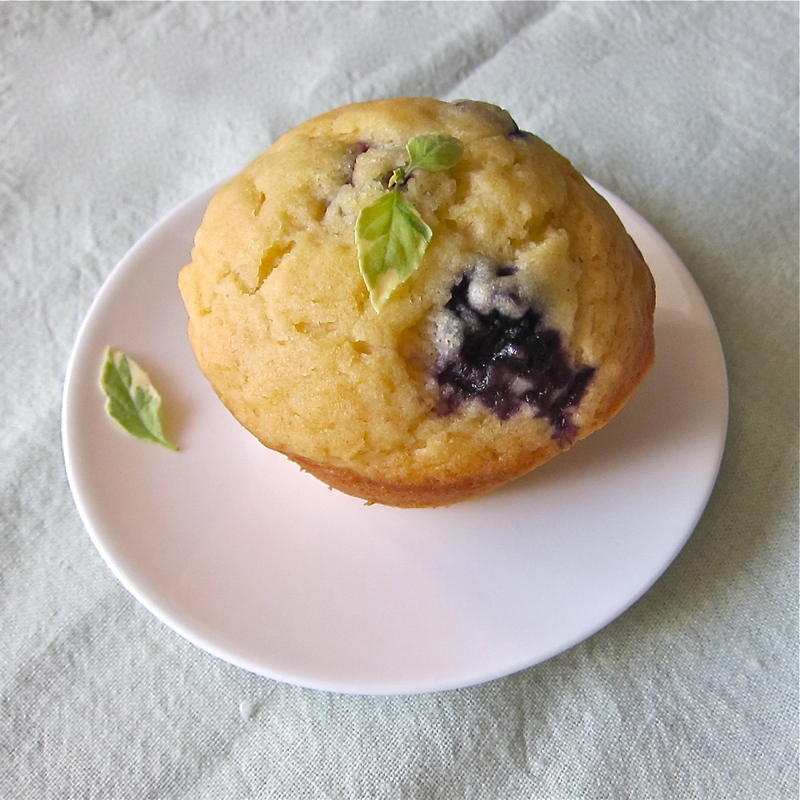 Juicy and sweet from the blueberrys, and the basil softly wraps around the muffin. Lemony, tender and sweet, I’m just in love with these muffins! Preheat the oven to 350 degrees F. Prepare muffin pan. Sift together the flour, baking powder, and salt into 1 bowl. In another bowl, whisk together the yogurt, 1 cup sugar, the eggs, lemon zest, lemon juice and vanilla. Slowly whisk the dry ingredients into the wet ingredients. With a rubber spatula, fold the vegetable oil into the batter, making sure it’s all incorporated. Fold in the blueberries and the basil. Pour the batter into the prepared pan and bake for about 20 minutes, or until a cake tester placed in the center of the muffin comes out clean. Allow to cool. Enjoy! Previous PostPrevious National Pie Day! I am totally diggin’ this flavor combo, Nastassia! These look really good! I love Meyer lemons. I love me some basil in my muffins! These are genius.